Who else was not expecting that ending? We have a lot to talk about today! Maddi and I are excited to be sharing our thoughts about each episode throughout this entire season with you. You can read our recap of "Hakeldama" here. Let's talk about that great episode now! "A quiet and mysterious threat is brewing - Clarke is torn between vengeance and mercy. Meanwhile, Kane and Octavia work together to avert a disaster, and Abby continues to worry about Raven." Maddi - The 100 opens with us back at Polis. Lexa startles awake after having a nightmare. Clarke comforts her as Lexa explains she saw the Commanders before her meeting. She saw their deaths, war, at the hands of the assassin. But Lexa sees more in this, that it's more than just a dream.. it's a warning. The former Commanders think Lexa is betraying their legacy as she tries to change the way of her people. Clarke reassures her that a cease-fire is not a betrayal and what she did stopped a war, "Your legacy will be peace." They share a quick moment as Lexa sees Clarke's drawing of her before Titus enters with a box, carried by guards behind him. I had a very bad feeling about whatever was in that box. I did have a thought that it could have been Murphy after we last saw him being taken by those Grounders.. you never know. Titus says it's a gift from King Roan for Wanheda, that it's proof of Azgeda's loyalty to the coalition and an answer to a yet unanswered question. Clarke's standing in front of it as the box lid falls to reveal none other than Emerson, as he lays his eyes on the person who killed his people. He doesn't hesitate to attack Clarke as it takes a somewhat late reaction from the guards and Lexa's command to stop him. Roan gifting Clarke of Emerson was justice for what the Queen and Emerson did to her people at Mount Weather. But to me it also felt like an attack at Clarke, to hurt her, because now she must face Emerson after what she did. 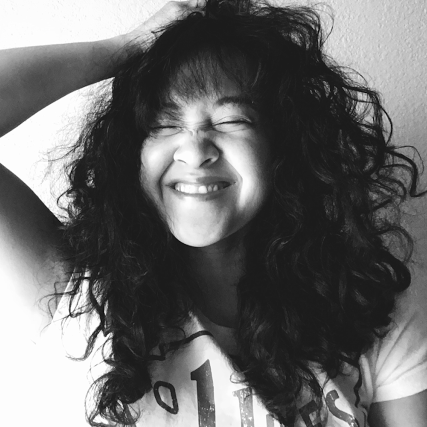 Kristy - I really want to see more of Azgeda! I still don't trust Roan's true intentions, even now after his mother has been killed, because we still don't know too much about him. I don't really know what to make of his gift for Wanheda because it felt as if he had a bigger agenda behind it besides just trying to prove his loyalty to the coalition. M - Back near Arkadia a detail of Pike's men are collecting water and soil samples as Octavia hides nearby trying to figure out what they're doing and reporting it back to Kane. Octavia is right, they're obviously trying to hide what they're doing, but the question is why. . .
K - I can't help but admire Kane right now. Even without the title he's working hard to try to save his people. He knows whatever Pike is doing as Chancellor is not the right thing, and he'll do anything to stop whatever he has planned. Kane is a real leader of his people. M - Being in the wrong place and the wrong time, an unlucky Grounder child is walking by, headed straight for them. They see him and you can see they're threatened as they go on the defensive, raising their guns at the child. But Hannah, being a mother, doesn't respond that way. She responds like a mother does to any child, the way most people respond to a child, you can see as the nurturing part of her shows and her inner instincts take control and kick in. Until we see the exact moment that she overrides it, choosing her head over her heart and orders them to shoot the child. The child manages to run before they begin shooting at him while chasing after him. I still wonder why Monty didn't stop his mother, or try to, from murdering all those people with Pike. I know he would have. . .
K - I've been wondering the same thing, because we haven't seen much interaction between Monty and his mother since they were reunited. One thing we have to remember is how we've seen grief make some of the Sky People choose to do the wrong thing. It seems to make them think the wrong decisions are the right ones at the time. We know Hannah lost her husband to the Grounders, and I see how this has turned her into who she now is.. even if I don't agree with her actions, I understand where they are coming from. M - Octavia immediately goes into action as she tries to get to the child first. 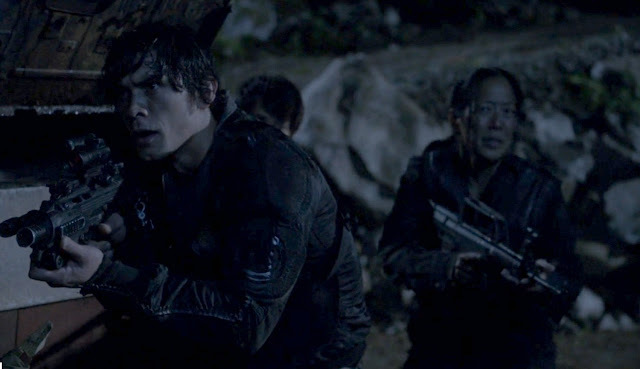 Octavia makes it, grabbing and hiding the boy from her own people. They close in on them, as they stay hidden, but with one sound they could both lose their lives. And of course they're hidden against a tree with poisonous sap that drips right on Octavia, as she almost gives away their position as more continue to fall on her. Octavia keeps growing stronger and stronger. She didn't hesitate to risk her own life to save the child, the complete opposite of what her people were doing. She's a real hero, she was in pain, suffering, and she held strong, and she was facing death but didn't buckle. She's incredible and a great character to look up to. K - Completely agree with everything Maddi said about Octavia. She is far from the girl we first met in episode one, and I'm still amazed by how much she continues to grow. She has that good Blake heart, that we know is deep inside of Bellamy, and always chooses to do the right thing, and I love her for it. Eventually Hannah walks away from where Octavia and the Grounder child are hiding. The child immediately leaves Octavia's embrace and flees, leaving Octavia completely stunned over the whole situation. She radios Kane telling him, "We need to find out what Pike is up to. Right now. Whatever it is, they were willing to kill a kid to keep it quiet." M - I still can't believe they were willing to kill a child, to take his life.. his life. He did you no harm, he's no threat, how could you.. Whatever they're up to it can't be good if they were willing to do that. M - Abby examines Raven's leg, as she says she no longer hurts anymore. I know you're not in pain anymore Raven, but whatever you took isn't a solution, it's just masking it and it's not good. No such thing exists where all pain just vanishes. It's got to be drugs or something that's messing with the mind, as Raven says Jaha gave her the key to the City of Light. K - I'm right there being just as skeptical as Abby is. "I thought you'd be happy for me," Raven tells her.. Yes we are all happy to finally see Raven smile, but how can I be truly happy for her when I know this won't lead to anything good? I don't think Jaha and his key to the City of Light will lead anyone to true happiness when this is all over. . .
M - Kane and Miller are on a mission to find out what Pike's up to as Kane gets serious about how serious this is. It's kind of symbolic how Kane is breaking laws and rules, the only way to save and stop his people from dying, and trying not to get caught yet he used to stand by those laws and enforce them. K - "Then let's not get caught," Miller tells Kane after realizing the seriousness of their situation. I'm happy to see Miller has chosen the right side in all of this. His character adds a lot to the show, and I'm looking forward to seeing him help out everyone we love in the little ways that he has, such as giving Lincoln that medicine in the last episode and what he's doing now. M - Kane tries to buy Miller time to plant something as Pike and Bellamy come their way. Kane uses everything he can to stall them. Jaha and those things he's distributing, the imprisoned Grounders, his opinions against what they're doing, and he succeeds. Pulling it off like nothing was happening, but afterwards we could see he's struggling. We've never seen him like this before, he's never showed it and it's clearly starting to take its toll as we see yet another new side to Kane. K - People who have lost so much will always cling to hope, the hope of there being something bigger than them out there. 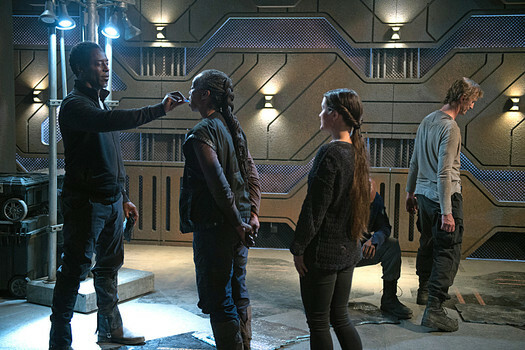 Jaha is clearly taking advantage of this by giving his key to the City of Light to many of the Sky People now. M - It seems Jaha's got more recruits and it's starting to look like a cult with all the manipulation and brainwashing. Jasper is nearby watching as he comments that they seem pretty happy. I can see what he's thinking, and all I can say is don't do it Jasper. Abby comes up and says she knows it's tempting but they need to find out what it is first. As a struggling Jasper, in a way, looks for help. M - Pike holds a meeting, as Monty and Monroe have now joined them. You're telling me that Monty would be okay with Pike and what he did? He's never been seen agreeing with Pike's beliefs and he's always been against violence, and with no explanation he just joins them. K - Agreed! What is this?! Why is Monty here with these people? Is it because his mom is there? Is it because he no longer has Jasper, so he feels like he has to "branch out" and find a new way to feel useful? Where is this new Monty coming from? We even see Bellamy eyeing him as Pike is speaking, because let's all admit that we just don't understand why he's in that room. 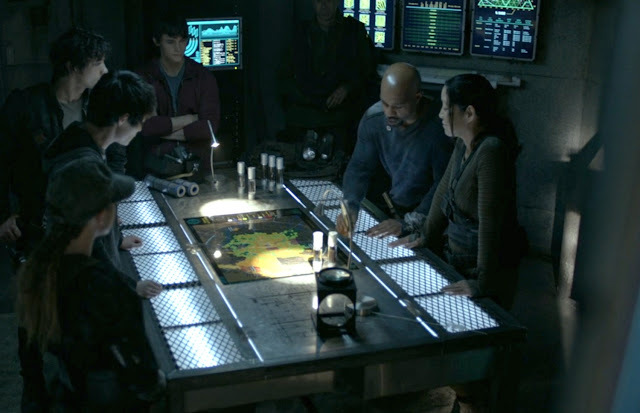 . .
M - Kane, Miller, and Octavia secretly listen in as Pike plans to plant and grow crops where they found that soil, because without the supplies of Mount Weather they will run out of food in a year as Monty notices that it's right where the village is. Bellamy tries to convince Pike that the people are not a threat but he wants that land and he's going to literally take it out from under them. They don't expect any resistance because they took out their fighters, their only defense, when they slaughtered the army that was here to help them. But Monty's right they will resist, they won't go down without a fight.. They are Grounders. Though I can't help thinking that if the Sky People were still a part of the coalition and were still the 13th Clan they could have been able to trade, and I'm sure the others would have shared the supplies they had. Lexa would have made sure that they had enough because they would have been her people. K - Yes, this is what I was talking about when I said that once we took a look at Polis it was clear that becoming the 13th Clan of the Grounders was a smart move. The Grounders are established. There is no doubt that the Sky People would have been taken care of if they stayed the 13th Clan, but of course Pike had to ruin that. M - Bellamy again tries to change Pike's decision as he is clearly not completely with him. Saying, "The Commander's message was clear.. blood must not have blood, that doesn't mean we can start taking. . ." This, this is a part of the Bellamy we know. The guy that's trying to stop Pike from destroying the village, the guy trying to get them to listen to the Commander's message, and to maybe stand along with it. K - This Bellamy is breaking my heart. I know a lot of people have a lot to say about Bellamy this season, how they can't forgive him for what he's been doing or the many other things being said about his character.. and I get that. I also get that Bellamy truly believes he is doing the right thing. All he's wanted is to save his people and feel safe himself, and after losing so much recently, he thinks this is the way. No I don't think his actions have been okay, but we know the real Bellamy is still in there somewhere otherwise he wouldn't challenge Pike as much as he does. M - Bellamy's right you can't just start taking lives after the Commander chose not to go to war. Lexa gave you a second chance, she was merciful but if you continue killing and taking whatever you want she will have to respond, to stop you, it cannot go unanswered. Pike is literally trying to start a war. He's making it so Lexa will have no choice but to act, do you expect her to just keep excusing you.. It also puts Lexa's life and position in danger as it gives her people more reason to disagree, to ignore her message, and go against her as they will turn to getting rid of her as a solution to their problem. K - Pike argues back, "Will you do what needs to be done for your people to survive or not?" Well, Pike maybe we would be okay with this if you'd actually use both your head and your heart to save your people from starving to death. . .
M - Pike manipulates with guilt, pain, and fear, making them see that they only have one choice. It's one or the other. That this is the only way for their people to survive, that doing these things is right. As a shocked Octavia hears her brother say, "We'll do what needs to be done." Can Octavia warn the village, can they evacuate? K - The pain and anger on Octavia's face killed me! 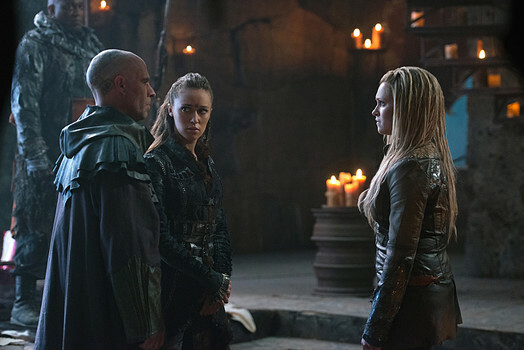 M - Lexa asks to see Clarke as they discuss the fate of the last Mountain Man. 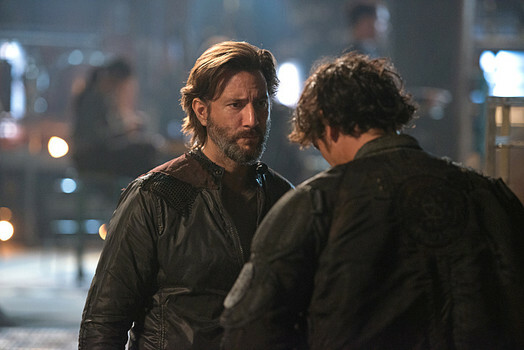 Titus believes he deserves death and shockingly Clarke agrees with him as he says, "It is human nature to need vengeance." K - Titus continues to say, "That is our way," as Lexa fires back, "That was our way." I have to applaud Lexa in this moment because now it is clear that she truly wants peace among everyone, and she's working hard to make that happen without shedding any more blood. M - Titus is clearly unhappy and against Lexa's decision to stop killing for vengeance as Lexa is offended Clarke would agree to this as she calls her out on it, "So blood must not have blood applies only when it is my people who bleed." Then I can't believe Clarke says, "That was about stopping a war, this is about finishing one." What is she doing? You fought for change, to stop war, but now you want to end one, a war that's already over.. You just helped influence the choice for change, to stop death and war, that blood must not have blood but now it doesn't apply to you. "He deserves to die for what he did," which was the most wrong thing to say to Lexa. She took the risk and the fallout for the decision and still is. She took the most dangerous chance of all and you play it off as if it's nothing, as if it doesn't matter. Lexa's trying to change the way of her people, to stop the killing for revenge and you want to do it.. wtf Clarke, wtf! This is a big mistake that will obliterate and undo everything, and all their progress if she goes through with it. Clarke knows better. Where's the girl who's always been about saving lives, even spared those who have done terrible things, and now she asks for death as the final decision falls on her shoulders. K - Clarke is far from the girl who spared Murphy's life back in season one, she chose to exile him instead of killing him, and now the Clarke we see is ready to kill a man. 49 cuts, can she truly kill a man with 49 cuts by her own hand? I would hope not but she's so hungry for vengeance that it looks like she might do it.. I think she believes it will help her with her guilt, but we all know it would only add to everything she already feels. M - Miller brings Octavia her horse as she plans to head for the village, to warn them, and encourage them to leave. Miller points out that if the Grounders don't leave they will be leading their own people into an ambush. But the outcome is far too great to risk. Octavia gets it, "Stop the attack, stop a war." She wants to stop war because peace is what matters, not how much land you have, who your people are, who you associate with or where you were born. K - There was so much truth behind this conversation, Octavia tells Miller, "What do you think happens when Lexa finds out Skaikru massacred another Grounder village?" Miller replies with, "War. More dead friends." They see what Pike can't see, that Lexa will not show mercy again if more Grounders are massacred by the Sky People. M - We heartbreakingly continue to watch the rift between Octavia and Bellamy continue to grow, "My brother is on the wrong side." K - It's nice to see Raven crying because she's so incredibly happy.. but it also scares me because I don't know what her consequences will be from taking the chip Jaha gave her. M - Jaha and A.L.I.E go to see Raven. She thanks them and offers her help for anything, which is exactly what they wanted. Raven now believes she owes them for removing her pain and suffering, and will now do anything for them. Is it really worth it Raven? They ask her to do something, which involves using her and her skills. A.L.I.E thinks her second version of her code is on the Ark, which is only used if there's a problem with the first.. what are they up to. I hope they're not making another one of her. K - Wow, I didn't even think of that! Both of them have acted suspicious since they arrived in Arkadia, and I knew they had a bigger agenda besides just getting people to take the chip that will take them to the City of Light. M - Raven questions this but then overlooks it. Raven don't put aside your reason, listen to your intuition, you know about this stuff, something's not right. K - After Raven agrees and walks away, Jaha admits, "We are after all asking her to find an upgrade for a computer program that ended the world." Okay, this is all starting to make a little more sense now, Red. M - These people have no idea what A.L.I.E did, that she ended the world.. But I'm sure they will find out soon enough. Yet they know she's an artificial intelligence so why has no one asked her if she was around for the war and destruction of the world 100 years ago? Or ask her anything about it or if she knows anything? It's obvious she was there because they don't have that technology but it existed before the end came. M - Bellamy, Hannah, Monty, and the rest of the group load their guns, ready to leave for the village. Kane shows up and starts asking questions but they refuse to tell him what they're doing. I love how they're keeping their plans all to themselves.. worried? Worried that your people will not like it, that they will disagree or be against it. Otherwise why not tell them.. why keep them uninformed. Bellamy says they're planning for their future and Kane says it looks a lot like their past. I agree they're not moving forward, they're reliving and recreating the past. K - Completely agree with that also. Bellamy tells Kane, "We are building a life here. Not trying to make peace with people who only understand war." If these were people who only understood war then why have they not attacked you after you massacred a bunch of their people? Why can't Bellamy see this? How does Pike have such a big influence on him? M - I can't believe Monty is going with them. He would never agree to wipe out a village let alone pick up a gun. What's even worse is Hannah is risking her son's life and allowing him to go along with them when there's no good reason to be doing what they're doing. I felt like a part of Monty was doing it for his mother. K - I definitely think Monty is doing all of this for his mother.. Why wouldn't he? He must feel like she is all he has left, so of course he's going to choose to be by her side. So we are not only seeing how Octavia and Bellamy are drifting apart, but we also see how everyone is affected by Pike's actions when Miller and his boyfriend are clearly on two different sides. This shows how Arkadia is going to be split into people who believe in Pike and people who want peace with the Grounders.. All of this sounds very familiar to elements always seen in civilizations. M - Pike's also keeping Kane out of the way, keeping him uninformed so that he has no power, so he can't stop or interfere in what they're doing. M - Octavia rides for the village. It was incredibly brave of her to just go walking into their village with the pain still fresh and raw from what happened. She warns them and they only give her the time of day because she saved the boy, from their village, earlier. K - "But I'm here to warn you, that the soldiers who did that are coming here now. They want your land. And they will kill all of you to get it," Octavia tells the Grounders and they find that as a threat, and kick her down until the child speaks up to save her. I have to say that Octavia truly shone in this episode. Just look at her face in this episode, and she continues to stand and do everything in her power to keep a war from starting! M - Abby can't figure out what that thing is Jaha is giving out to people. Apparently it's not a drug. K - Jackson explains it more to Abby by telling her that Raven's data supports the fact that it is helping the pain go away. I thought he said something interesting to her, "We've all been through so much that it's hard to recognize hope." What did I say.. I knew that Jaha was taking advantage of how lost the Sky People feel and giving them hope in this key to the City of Light. M - Kane walks in broken. He's blaming himself for what has happened because he wanted a vote. It's not your fault, the people chose Pike and he's a good manipulator, preying on people and their weaknesses, and pain. It's breaking him that he can't do anything to help, to stop it, to protect his people. Kane believes Bellamy is the key and so do I. Bellamy has a great influence on many, they follow him as he leads. If they can make him see reason and lead him back onto the right path they still have hope. But Kane is struggling to reach him, as Pike's hold on him is strong. K - Bellamy is definitely the key, especially now that Clarke isn't there. 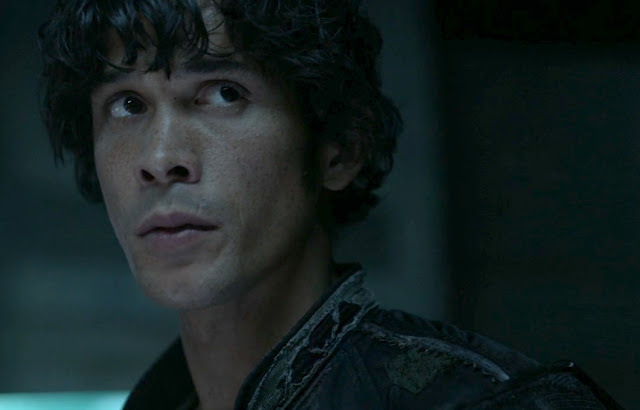 People respect Bellamy, and look to him in a way they look to Clarke. Honestly, I don't know how Kane is going to get through to him though since all his attempts have failed so far. M - For a second there I thought Abby was going to kiss Kane and my heart literally jumped, instead she kissed him on the cheek as Abby calls it hope. That was sweet, it was like showing him that she hasn't given up, that she believes in him and that she still has hope in him and hope that they'll get through this. K - Yes, Kabby! Completely agree. M - At the village it's a tense moment. Will the Grounders leave? Will they trust Octavia? Or are they going to turn on her? I had a bad feeling about them and I see that feeling was right when they start doing something.. something with the poison from the tree. They turn on Octavia knocking her out as the danger she's in intensifies. K - Back in Arkadia we find Raven with A.L.I.E, and we can tell she's still curious about her because she asks, "Why would the second AI be in space?" That's right Raven, use your intelligence to question all of this! M - Raven's getting A.L.I.E access into the Ark's main systems when Jasper walks in. He apologizes to Raven for taking Finn's ashes. He apologized for something they knew nothing about. This is a big step for Jasper. He did it for himself, he could have easily kept it to himself and not told anyone which would have just caused him more pain and suffering. Did anyone else notice Raven had a severe lack of a reaction when hearing he took Finn's ashes? I wanted Jasper to help Raven, I hoped they would bond over their suffering and use that power to heal and get through it together. Instead Raven uses it to try to recruit Jasper. K - I definitely noticed the lack of emotions when Finn's name was mentioned. I don't think Raven would hold a grudge against Jasper for taking Finn's ashes, but I do think she would be more upset about finding out about this.. but she wasn't, and that concerns me. M - All of those people took that pill and not one of them finds it odd that others can't see A.L.I.E, to me it's weird and very creepy. If she's a hologram why can't everyone see her, why must they take that thing? 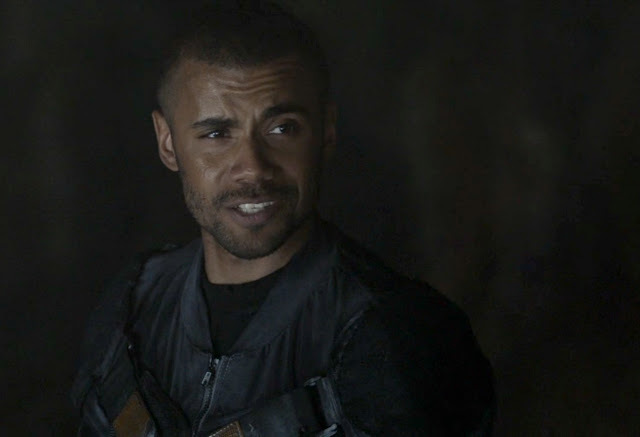 M - Clarke decides to proposition Emerson. He doesn't hold back, forcing her to face what she did. "What's the matter, you don't like to be faced with your demons?" No one likes facing their demons but I think Clarke was avoiding hers. I thought she went in to finally face him and what she did, but then she makes him ask for mercy. I thought that was kind of cruel, I know what he did was wrong, but you killed all of his people, his own children, and you're making him ask you for mercy.. he will never do it. K - Emerson laughs in Clarke's face telling her, "I don't want mercy. I want revenge. I want you to suffer the same way that I've suffered." 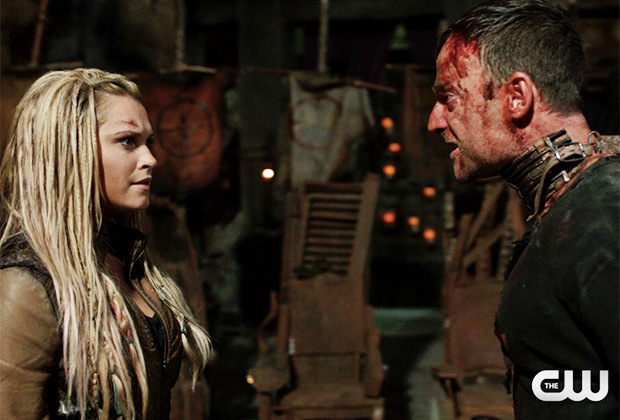 I don't think Clarke found what she was looking for when she went to confront him.. Was she looking for forgiveness? Closure? We know that Clarke isn't this person who she's showing, but I think she wants to feel anything but pain and Emerson has awaken all those feelings she's been trying to escape, and she can't run away from this anymore. M - Clarke stands there treating him like a monster and murderer who deserves death for helping kill her people at Mount Weather, after she killed all of his whole kind. I understand that they took lives under different circumstances but I don't think the way Clarke is acting is right. Emerson ends by telling her, "You can kill me Clarke, but you can never escape what you did." I think she lost her handle on her emotions, she thought it was over and in walks a Mountain Man and now she must relive what she did. She clearly doesn't want to deal with it, as killing him would end it all.. It would all be over as it fades into history. No one to answer to, no one to face what she did. Titus is waiting in Clarke's room. I don't trust him at all. Titus is going to use Clarke to control Lexa, influence her, to change her decisions. He's going to use both of their feelings for each other. Possibly to save Lexa but I don't think that's his plan and we all know Clarke won't let Lexa die. I'm not sure if Titus' care for Lexa is leading him to do the right thing. 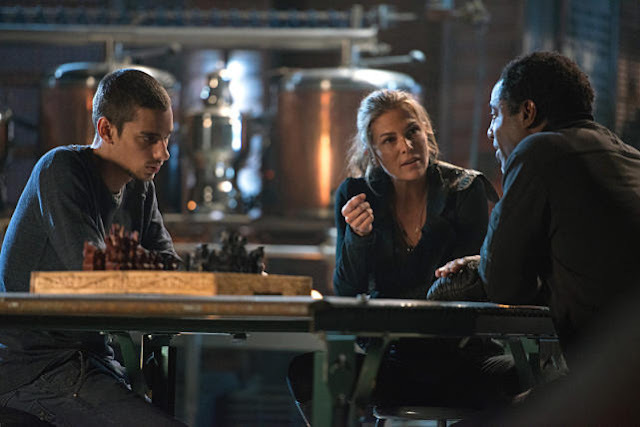 M - Jasper debates whether to take the thing given to him by Jaha. They're lying to you, messing with you, and using you. As Jasper goes to do it Abby stops him.. Thank god for Abby. Abby demands to know what it is and what it does. "It's a silicon based device. Once ingested, the filaments reconstitute within the brain stem, and interrupt pain receptors, inhibiting certain neural pathways from firing" ... so that's what it is. K - Yes thank goodness Abby stopped Jasper from taking the chip! Jaha was clearly manipulating Jasper by telling him, "Pain is pain. Your scars run deep Jasper." Did anyone else find it weird that A.L.I.E was telling him what to say? It felt almost as if Jaha was A.L.I.E for a moment, even by the way he was speaking to Abby. 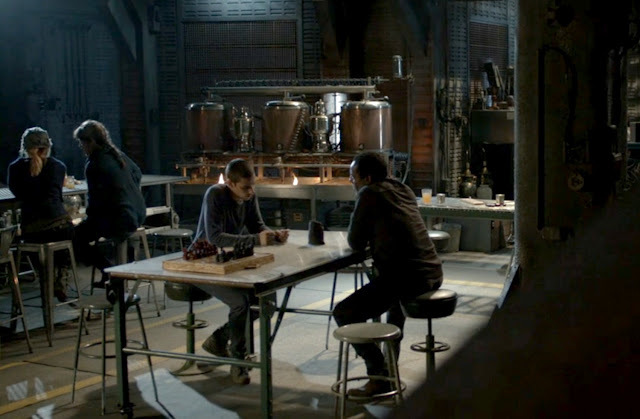 M - Abby asks Jaha would he give it to Wells without testing it first, and he actually doesn't know who he is.. his own son. He didn't even remember who he was. This is not a good sign. After this Abby shuts him down. "Whatever it is. It's eliminating more than just pain." I knew it messed with your mind and brain. K - I can't believe Jaha didn't remember his own son! M - Feelings are a part of humanity. They keep you grounded and remind you that you're human. Without pain, it's like having sadness but no happiness, you can't find one without the other. They're all connected you can't just remove one because the rest won't work properly. First Jaha shows and feels nothing when he watches someone die, then he forgets his own son. You lose yourself, your humanity, and you lose all feelings. It would be disastrous to remove pain entirely. K - I completely agree that you can't have happiness without some pain. It's amazing to see what this chip is doing to Jaha without him even realizing it.. Is it memory loss? Is it something bigger? M - They throw us another shock when we see Jackson tell A.L.I.E not to worry, that he'll keep an eye on Abby. I was shocked and so was Jaha to see that he's with them. "Hope is right in front of us." I should have seen it coming. He was talking about the City of Light. I thought he was doing well but sometimes there are things we cannot see. M - At the village they've set a trap as we feared would happen if they were warned. The group arrives and they find it odd that no one is around. K - All I could think about was how the fact that these Grounders are not going down without a fight proves that Lexa is in danger of her own people. Her people want revenge for what the Sky People did. M - Octavia escapes from her capturers and rides to warn them. They light the place up causing poisonous smoke to go up everywhere. Monroe goes down and Monty runs back into the smoke to help her. Hannah crumbles and breaks in terror as her son runs into the deadly smoke. I thought Hannah might realize now the danger she's putting her son in, no matter if she thinks what they're doing is right for their future. The fear when she thought she'd lost her son, I hope it's a wake up call for her. Monty survives and manages to save Monroe. Now this is what you should want your child to become, he risked his life for someone else while everyone else fell back not bothering to even try to save her. Monroe doesn't make it and Bellamy loses another life that he was trying to protect and you see this is the moment that will tear a break in Bellamy and Octavia's relationship. Not only will he blame himself, but this time he will also blame his sister because she's the one who warned them. The Grounders recapture Octavia and now she's in a lot of danger, when all she wanted to do was help everyone, to save everyone. K - I hope this will be a wake up call for all of them! We could see everyone's true colors through this scene.. Bellamy was devastated over Monroe's death, Monty went back to save her, and yet Hannah was more concerned about the traitors in Arkadia. Grant it she may have just been angry about her son almost getting killed, but still.. I think that moment said a lot about the true nature of these characters. M - At Polis it's time for Clarke's final decision. I knew she wouldn't do it, it's not who she is. They offer her the knife to take Emerson's life but making the right decision she doesn't do it. If Clarke had done it she would have destroyed Lexa's decision and progress to change her people, it would have set everything back. It was also what Emerson wanted. He wanted to be rid of this world and to be with his family again. She knew this and taking it from him was her final move in their game, and she made the winning move as Clarke finally realizes that she would be killing him for what she's done. K - This is the Clarke that I love, "I don't know if your death would bring me peace. I just know I don't deserve it." I was proud to see Clarke admit this, and with her decision not to kill him. K - Can we talk about Lexa's speech though? Lexa silences her people as she tells them, "Her actions show us a promise for a new future, a world in which violence does not always answer violence. A world in which our children can flourish without the shadow of death." Yes Lexa, yes! Did abandoning Clarke at Mount Weather change things for Lexa? Is that why we are seeing such a different side to her this season? Either way, I truly appreciate the leader she is becoming and this is the leader the Sky People need to ally with while appreciating her mercy for their recent actions. M - Emerson is banished and must live with what he did and the fact that he's the last Mountain Man for the rest of his days as Clarke wishes, "May you live forever." I wouldn't be too pleased with yourself Clarke, you have to live with what you did too. Pike uses what Octavia did to further distance Bellamy, especially from the people who are trying to get through to him. This is just going to push him more towards the wrong direction, as Pike uses his sister against him. Pike has no right to blame this on Octavia, it wasn't her fault she was just trying to do the right thing. She made a decision and so did they, to go to that village and kill them. They obviously know Kane is a part of what happened. But they need proof against him. The question is, are they willing to plant it, falsify it, to achieve what they want? I think they might. If they get proof against Kane it will end him once and for all, his people will turn against him, and they'll never see him in the same way again. It will destroy him and not only politically but him as a person. He's in real trouble. M - Poor Murphy is being tortured again. The moment Murphy said, "I don't know anything more about Clarke," I knew immediately it was Titus as he questions Murphy about the pill, the token, the "Sacred Symbol". Raven, Jaha, and A.L.I.E can't find her code anywhere on the Ark, it wasn't on any of the 12 stations, until Jaha reveals that there was supposed to be 13 stations. The 13th station blew themselves out of the sky to avoid joining with the other stations. Then The 100 blows our minds, showing in the room with Titus and Murphy is something, a ship, with the name Pol--is on it, some of the letters have been burnt out as Jaha reveals the 13th station was called Polaris. Pol--is.. Polis, also known as the Grounder capital, came from a ship of the Ark.. Are the Grounders from the 13th station? Are they from people of the Ark or did they just come across it. It could also explain why they could live on the ground when the Mountain Men couldn't. And I just realized that it can't be a coincidence that there's 12 stations and 12 Clans, and that there was meant to be a 13th station and a 13th Clan. We need answers! K - Wow, you totally blew my mind even more! What is happening right now?! I never even thought about the number of stations and clans, and now I can't help but wonder what it all means.. We really do need answers! M - I'm disappointed that Clarke went back to Polis. I know she can't stay at Arkadia but I thought she'd do something for Bellamy. She saw what he's turned himself into yet she went back to Polis. She knows her leaving was a part of it and that he has no one believing in him like she did yet she didn't stay to try to help him through it, to pull him back from that dark place he's reached. She walked away again. . .
K - I completely agree. After last week's episode I realized how much I've missed seeing Bellamy and Clarke together, and no it's not because I'm a Bellarke fan.. It's honestly because I just think Bellamy and Clarke are the heart of this show. I'm ready for Clarke to come back to Arkadia, and stop running away from her actions, and be with her people - plain and simple. I'm looking forward to the next episode though. I love the shot of Indra and Octavia, they are an awesome team together and I can't wait to see them in action again! M - I can't wait to see what happens next! Join us that weekend as we recap episode seven. We can't wait to discuss all things The 100 with you!